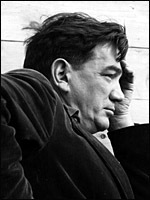 Alexander Mackendrick was born in Boston, Massachusetts on 8 September 1912, the only child of a shipbuilding draughtsman and civil engineer, Francis Robert Mackendrick, and his wife Martha, who had migrated to the USA from their native Glasgow in the previous year. When Alexander was only six years old, his father died in the post-World War I influenza epidemic, and his mother, attempting to pursue a career as a dress designer, gave the boy over to his grandfather, who took him back to Glasgow in 1919. He was never reunited with his mother, and later in life realised that his childhood had been lonely and rather unhappy. After attending Hillhead High School between 1919 and 1926, Mackendrick enrolled at the Glasgow School of Art for three years before moving to London to take up a job at the advertising agency J. Walter Thompson (JWT). He was soon promoted from layout artist to art director and he remained at JWT throughout the 1930s. Characteristically, he said of the early years of his career that his training in advertising had been invaluable, "though it's an industry I in effect despise". During this period he co-wrote a script with his cousin Roger MacDougall , which was bought by Associated-British and released under the title Midnight Menace (d. Sinclair Hill, 1937). Between 1936 and 1938, he also scripted and storyboarded five cinema commercials for Horlicks, which were shot in Technicolor by the stop-puppet animator George Pal . During the early years of World War II, Mackendrick scripted and storyboarded wartime propaganda films for a new animation unit at JWT headed by John Halas and Joy Batchelor . In 1942, he and MacDougall set up their own production company, where Mackendrick cut his directorial teeth with three ninety-second 'instructional' films to be inserted into the Pathé Gazette newsreel. In the following year, he travelled to Algiers and Italy with the Army Psychological Warfare Branch (PWB), drawing cartoons for Allied propaganda leaflets. After the fall of Rome he and the art director Peter Proud directed two documentaries, I granai del popolo (a propaganda piece aimed at persuading Italian farmers to make surplus grain available for general distribution) and Le fosse Ardeatine (on the aftermath of the Nazis' massacre of partisans at the Fosse Ardeatine in Rome). When the war ended, Mackendrick set up Merlin Productions with MacDougall , making documentaries for the Ministry of Information . When the company ran into financial difficulties, Mackendrick sought work at Ealing Studios and in 1946 was taken on as scriptwriter and production designer on Basil Dearden 's Saraband for Dead Lovers (1948). This was the start of a new phase in his career: he stayed at Ealing for nine years, directing five films, establishing himself as a key figure in Britain's post-war film industry and acquiring a considerable international reputation. Mackendrick 's first film at Ealing , Whisky Galore! (1949), ranks high among the comedy classics of British cinema. Based on Compton Mackenzie 's novel about a shipwrecked cargo of whisky off the Hebridean islands, the film focuses on disagreements between the inhabitants of the island of Todday and officialdom (in the form of the Englishman in charge of the island's Home Guard) about what should be done with the whisky. In a variant of a theme which was to surface repeatedly in Mackendrick 's work, the Englishman represents Innocence, the islanders Experience. But in Mackendrick 's world, oppositions are rarely clear-cut and humour is always double-edged: in Whisky Galore! innocence is potentially dangerous, experience devious and exploitative. The Man in the White Suit (1951), Mackendrick 's next assignment, was based on a play by MacDougall about the invention of an indestructible cloth by a scientist working for a textile mill: in the film the scientist, Sidney Stratton ( Alec Guinness ), is an idealist who regards his invention as potentially revolutionary. One of Mackendrick 's dangerous innocents, Stratton fails to take account of the less positive aspects of his brainchild; and it is his lack of awareness that provides the source of the comedy. In Charles Barr 's view, "perhaps the most intelligent of British films [and] certainly one of the most complex", The Man in the White Suit is stamped with its director's mordant humour and displays degrees of irony and ambiguity exceptional even for Mackendrick . Mandy (1952), the only non-comedy in Mackendrick 's Ealing output, is about the struggles of a deaf-mute child to learn - in the face of her parents' obtuseness as well as her own disability - to speak. A collision between awareness and unawareness is written in the film's organisation of spaces: walls, windows and doors figure as markers of isolation, and of freedom. The extraordinary performance Mackendrick elicited from child actress Mandy Miller in the title role helped Mandy win the Special Jury Prize at the 1952 Venice Film Festival , but this powerful and moving film remains surprisingly underrated in Mackendrick 's oeuvre. The Maggie (1954), co-scripted and directed by Mackendrick , is generally rated as the least satisfactory of his Ealing films. 'Maggie', an ancient steamboat working off the west coast of Scotland, is chartered to carry household equipment for a rich American. The skipper and his client have totally different notions of time, and the American is repeatedly frustrated by the endless delays to the delivery of his cargo. Notwithstanding the similarities in plot and setting to Whisky Galore! , The Maggie offers no easy points of identification, and is even more morally ambiguous than the earlier films. Its humour, in consequence, is often uncomfortable. By the mid 1950s, Ealing was in decline, and Mackendrick 's The Ladykillers (1955) is widely regarded as the last of the great Ealing comedies : it was certainly the studio's last commercial success. Five gangsters fall under the spell of a little old lady ( Katie Johnson ) whose innocuous exterior belies a steely core. Like Mackendrick 's earlier comedies, The Ladykillers is exceptional in comparison with the rest of Ealing 's output: it is a 'problem comedy', a film of cruelty and cunning as well as charm, ending ambiguously and denying any comfortable audience identification. But if the film - and especially the character of the old lady - stretches the studio's most cherished conventions to the limit, the bitterness of its irony was not fully appreciated at the time, and thus proved no handicap to its winning two British Film Academy awards. Most of Mackendrick 's Ealing films are distinguished by consistent flair and mastery of narrative technique; and as an oeuvre, represent the most distinctive and stimulating body of work of any of the studio's directors. In different modes and genres, all five films develop variations on the themes of unawareness and misperception, innocence as a destructive force, and the outsider versus the community; and all speak in the "ironic, critical tone of the director working 'in enemy terrain'". (Philip Kemp). During this difficult period, Mackendrick returned to advertising, directing eight 45-second television commercials for Horlicks; and made a brief excursion into stage directing. He also worked for a short time on Guns of Navarone , but differences between him and the producer, Carl Foreman , proved insurmountable and he was replaced by J. Lee Thompson . His directorial career was put back on track by his old Ealing boss, Michael Balcon , now an independent producer. Sammy Going South (1963) was an ambitious location-made epic about an orphaned ten-year-old boy who sets off to walk the length of Africa in search of an aunt who lives in Durban. Despite Mackendrick 's acute direction of the child protagonist - and although the film was chosen for the 1963 Royal Film Performance - reviews were lukewarm and Sammy Going South performed poorly at the box-office. It was another two years before Mackendrick 's next film, A High Wind in Jamaica (1965). While at Ealing , he had proposed an adaptation of Richard Hughes 's novel, but the rights were owned by 20th Century-Fox , who refused to relinquish them. After many vicissitudes, Mackendrick found himself directing the film for Fox - who expected a Disney-like tale of plucky children and loveable pirates rather than the disturbing account of lethal innocence and misjudged experience which had attracted Mackendrick . With the front office having little confidence in the project and the director unhappy with the compromises that had been forced on him, the shoot was tense, and Mackendrick was taken off the picture at post-production stage. Nonetheless, High Wind offers some deeply observed portraits of children, and the clash of perceptions between children and adults is intricately expressed: the film met with a good deal of praise from the critics, but Mackendrick was disappointed with it. Increasingly, he was finding that the frustrations of film directing were outweighing the satisfactions. His next picture was to be his last. Don't Make Waves (1967), a Hollywood production and Mackendrick 's first comedy since The Ladykillers , is the least known and the least accomplished of his films. It is a film, according to Mackendrick himself, "of such silliness that it is a humiliation even to have to talk about it" (Kemp, p. 218). The experience put him off Hollywood for good, and he returned to London to work on another long-cherished project, Mary, Queen of Scots , for Universal UK . But as the film was about to go into production, the studio fell victim to the late 1960s recession in British film production and Universal closed its London office, cancelling all productions. In late 1969, faced with the prospect of having to return to Hollywood if he wanted to continue directing films, Mackendrick was offered, and accepted, the Deanship of the Film School of the newly-established California Institute for the Arts (CalArts). This proved to be a highly successful career change, and he remained in post as Dean until 1978, when he stepped down and became a Fellow of the Institute, continuing with his teaching. In the summer of 1979, he returned to Britain to teach a course at the National Film School , but further return visits were precluded by his health: having suffered from asthma all his life, he now had emphysema. Notwithstanding, he carried on teaching at CalArts almost until his death, on 23 December 1993, of pneumonia. He is survived by his widow, Hilary, and sons Kerry (from his first marriage), Matthew and John. Alexander Mackendrick never looked back after he stopped directing films. A perfectionist in an industry devoted to profit, his filmmaking career faltered after he left Ealing and set up as a freelance director on the open market. It was both his luck and his misfortune to have served apprenticeships in large organisations ( JWT , the Army, Ealing Studios ), where he was insulated from the hard-edged, deal-making side of the creative industries: "I've always been happiest in these big organisations", he once said, "where I'm free to make mischief from within - where I get all the centralised support, but I've got enough skill to exploit it for my own benefit". But if the overall sense of Mackendrick 's career is of great potential unfulfilled, his oeuvre, though small, is distinctive and always rewarding, the work of a visually acute filmmaker who thought in images and movement whilst always remaining in command of cinematic storytelling; a director whose films offer a complex and ambiguous mix of pessimism, callousness, mordant humour and startling empathy with the innocent and brutal world of the child.